A recent Writer’s Digest article challenged readers to share the top ten books that have never left them. As someone who has spent the bulk of her life reading, writing and thinking about books, only one word came to mind: impossible. 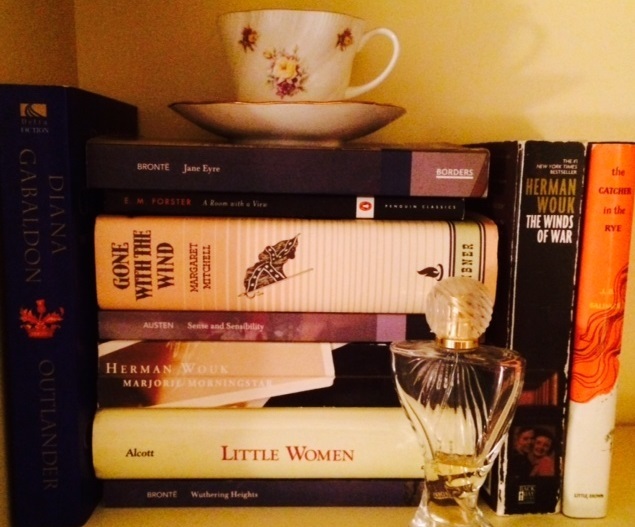 How could I limit my list to ten books without including everything Jane Austen, Hemingway and Dickens ever wrote? Would my list be a list without A Tree Grows in Brooklyn or How Green Was My Valley? If you want to get technical, The Baby-Sitters Club and Sweet Valley High should be included, because to this day, Stacy McGill and Jessica Wakefield are just about the coolest girls I can think of off the top of my head. But a challenge is a challenge, and if my favorite feisty heroines of fiction have taught me anything, it’s that action is the only way of getting somewhere. I thought about pouring through my bookshelves and Goodreads trying to create some scientific formula for selection, but I decided to just go with my gut, which has led to the following list. Science was never my strong suit anyway. My favorite, favorite book of all time. I love Scarlett O’Hara. I love Rhett, and Mammy, and Melly. Ashley—well, sometimes I want to strangle Ashley and find some kind of support group for the women who love him, but, you know. He’s okay. As many times as I have read this book, I never fail to find something new to love. I also never fail to blubber like a baby through half of it. Every time, I think things may end differently. Every time, they don’t. And every time, I keep going back for more. I can’t imagine my life without it. I remember reading this for the first time and being dumbstruck after I put the book away by the realization that Heathcliff—this person who had consumed my every thought, who I had loved and feared and pitied and understood—was not a living, breathing human being. I still can’t wrap my mind around it. I keep thinking that one day I’ll see him gambling at Mohegan Sun, ranting to Hareton about one tree growing as crooked as the other. But that’s just crazy. Heathcliff would never let Hareton out of the house. Again, does poor, plain, obscure, little Jane really only exist on the page? Because I could swear we went to Lowood together. This book is perfect, and “Reader, I married him” may be one of my favorite lines in literature. The first time I read this book, I was a freshman in high school and I had never met a narrator like Holden Caulfield. He was so casual. And he talked right to me! I never knew you could do those things in a novel. So yes, Holden, I did really want to hear about it—about all the phonies and the secret slobs and the David Copperfield kind of crap. I still do. I was eight years old when I first met the March sisters and I loved them immediately. I wanted to take part in their plays. I wanted to ice skate with Laurie. After what happened with Beth, maybe I didn’t want to go visit the Hummels. I’ve revisited this book more times than I can count in my life, and I have related to all four girls and called each of them my favorite, at some point or another. I read this book every summer and it never gets old. Neither does my love for George Emerson. I’ve never been able to look at violets the same way again, and Lucy Honeychurch is kind of my hero. There are books, and then there are books. I firmly believe that this novel, along with its sequel, War and Remembrance, should be required reading for all Americans. It provides a thorough and compelling depiction of World War II through the eyes of one naval family, and I find myself thinking of the characters—even the most minor ones—constantly. It’s also really helped me with Jeopardy! over the years. Two books by the same author when I only have ten spots? Either I’m crazy, or Herman Wouk is just that good. I’ve grown up with Marjorie Morningstar, and like Marjorie, I will always pine for the dashing Noel Airman and his crooked elbow. I still can’t believe his Broadway career didn’t take off. I don’t think my life would be the same without any of Jane Austen’s novels, but Sense and Sensibility is my absolute favorite. Yes, I love the Dashwood sisters and Colonel Brandon and Edward Ferrars, but the real star of the show here is Willoughby. I can’t tell you how many years I’ve spent defending this cad to anyone who will listen. That’s called building a great character, and that’s why Jane Austen is Jane Freaking Austen. I have always loved books, but Outlander is a flat out addiction of mine and I should probably seek help for it. But I can’t, because I love Jamie Fraser too much. So call me a bloody, thick-heided, stubborn Scot, but leave me alone because I have to think of a way to get to Craigh na Dun so I can travel to the 18th century. Books. Aren’t they the best? Can you narrow your list to ten that have stayed with you? 1. “After what happened with Beth, maybe I didn’t want to go visit the Hummels” made me laugh far too loudly for a Monday morning. There were questions asked from coworkers. 2. HOW did I not know that the same guy wrote Marjorie Morningstar AND Winds of War? You must have told me, so I blame myself. But that guy is CRAZY prolific. 3. Don’t go to the 18th century. It’s not a super-healthy place for a woman to be . . .
4. I always, ALWAYS think Gone with the Wind is going to end differently. Someday we’re going to really hash out exactly how Margaret Mitchell did that. Because we need to figure out how to replicate it in our own works. 5. Can’t believe two Wouks but only one Austen. And I can’t believe there’s only one Austen either, but I only had ten spots! It was not an easy task. I feel like Laurie is the guy you WANT around when skating on a pond. Which, btw, I don’t do. Possibly specifically because of What Happened with Amy. Good point. In retrospect, this may be why I’ve never learned to ice skate. Who knows, I could have been the next Meryl Davis! Thanks, Louisa May Alcott. “…sometimes I want to strangle Ashley and find some kind of support group for the women who love him, but, you know. He’s okay.” Laughed so hard. I have to say, I am shocked, SHOCKED, that Marjorie Morningstar is #8 on this list. Number eight! I’m downright flabbergasted. Outlander is INCREDIBLE. The kind of book series that absolutely consumes you…and it just keeps going! The only book I can relate to on here is The Catcher in the Rye. I may need to make my own list like this sometime. So hard to just choose 10. That would be awesome, because you’ve whet my literary appetite with a few of these & I’m always looking for good book recommendations. Thanks! I need to read Little Women!